Rhodium plating is a common procedure utilized with jewelry to enhance the scratch resistance of the surface while giving it a brilliant reflective appearance. But, what is rhodium? In what circumstances is this procedure utilized, and what should the consumer know about cost, the average lifespan of the treatment, and rhodium itself? Read on and discover everything you never knew you wanted to know about rhodium plating. Rhodium, atomic number 45 on the periodic table, is a rare metal that is colored silver-white. Rhodium is 10 times more expensive than gold, which begs the question of why rhodium is used merely for plating instead of as a foundational metal for a piece of jewelry. The answer to that lies in another prominent characteristic of the element--the fact that it is extremely brittle. 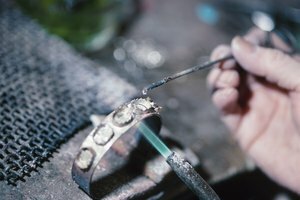 The most common purpose of rhodium plating is to augment a piece of "white" gold jewelry to enhance the coloring and provide an added layer of protection against damage. The reason rhodium is so often paired with white gold is simple: White gold does not exist in fact. White gold is nothing more than gold mixed with another metal that has a white cast (usually silver, palladium or nickel). This results in a slightly yellow tint to the final product. As the buyer of white gold is looking for a brighter sheen, rhodium is used as a plating material to add that extra shine. However, aside from its coveted reflectiveness, rhodium has protective properties that make it functionally useful as a plating metal. Rhodium will never discolor or tarnish. Aside from that, it is a harder metal than gold, which means it is more scratch-resistant and more able to survive the rigors of daily wear. Rhodium is also occasionally used on silver (primarily for its scratch-resistant properties) and platinum (to enhance shine). One downside of rhodium plating is that it will not last in perpetuity. The metal will eventually wear away and require replating. The lifespan for rhodium plating varies, but depends on a number of factors, including the primary use of the piece (frequent use will increase wear, as will contact with the elements or prolonged contact with skin), and the original thickness of the plating. It is a good idea to consider spending extra to get thicker plating on pieces used every day. Before buying silver, platinum or white gold jewelry, ask if it has rhodium plating to enable an accurate estimate of the cost of ownership, taking the necessity of replating into consideration. 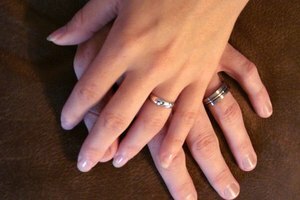 While it might be a shock to learn the coveted color and shine of that treasured white gold piece of jewelry is actually rhodium, it is better to understand that fact now instead of learning it for the first time at the jeweler, where that knowledge will undoubtedly be accompanied by a bill for replating.